6.5TD NEW OEM Fuel Filter Assy. Fits all C/K trucks 92-00 including Suburbans and Tahoes, and Vans 94-95. 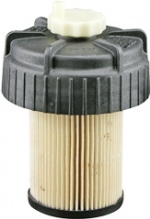 Fuel Filter Element/Water Separator for all 6.5TD Vans 96 and newer. 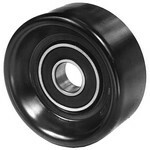 Correct Tensioner Pulley (aka idler pulley) for all 6.5L equipped C/K trucks 92-95. 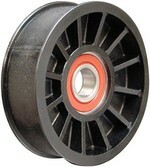 Correct Idler Pulley for all 6.5L equipped C/K trucks 96 and newer. Oil Filler Cap all 6.2 and 6.5 trucks thru 97 using the metal oil filler cap. Oil Filler Neck Grommet/Seal for all 6.5 engines. Ignition Switch, 95-96 C/K Trucks, Subs, Tahoes and Yukons. High Performance oil filter for all 6.5 diesels 92-05, all vehicles. Shell Rotella-T 15W-40 Diesel Engine Oil, Single one gallon jug. Shell Rotella-T 5W-40 T-6 Synthetic Diesel Engine Oil, single one gallon jug. Replacement Diesel Fuel Heater for all 6.5TD's in all C/K trucks and Suburbans 92-00. Oil Cooler Hose Adaptor Fitting for all 6.5's 92 thru 97-1/2. COMMON NUISANCE OIL LEAK on the 6.5. Oil Cooler Hose Adaptor Fitting for all 6.5's 97-1/2-present. COMMON NUISANCE OIL LEAK on the 6.5. Engine Oil Cooler for all 6.5 C/K trucks 97-1/2 to 2001. Engine Oil Cooler Hose Set for 6.5 C/K pick-up's 92-94 with external oil cooler. Engine Oil Cooler Hose Set for 6.5 C/K pick-up's 95-97-1/2. Engine oil cooler hose kit for all 6.5 C/K pick-ups 97-1/2 and newer. Fuel Filter Cartridge for 84+ 6.2's and 6.2-6.5 conversions.